The Cesar Chavez Student Center may lack the glitz and glamour of the Vegas Strip but on Friday, Nov. 8, the Associated Student, Inc.’s Casino Night brought some of the excitement of Sin City to the SF State campus. The event gave students with a valid identification card a voucher worth 250 credits to use at five casino games including blackjack, craps, roulette and two types of poker. The event, which was a departure from ASI’s more traditional dances and movie nights, was designed to give students an entertaining and lighthearted way to kick off Veteran’s Day weekend. It was then up to the student’s skill with the card games, and a little bit of luck, to win enough chips to purchase one of the many gifts ASI provided or a raffle ticket for some of the larger prizes of the night. Prizes included items such as a 32-inch television set or an iHome. For the first time, ASI held the event in the Recreation and Dining level of CCSC. A total of 10 gambling tables were strewn across the room, each packed with players who let out an occasional bellow of joy that could be heard over the mixture of both contemporary artists, and more classic Vegas-themed tunes blaring across the room. 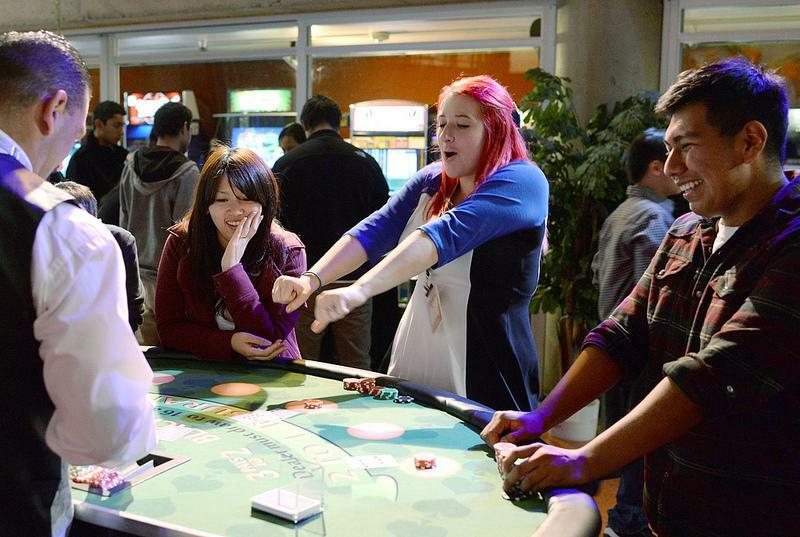 Although the event was hosted by ASI, it was Custom Casino Events who chose the games, provided the tables, decorations and professional dealers who helped give students a legitimate casino experience. And though the dealers were professionals, as they handled their duties at the tables they taught the students the games to help them win. The combination of using free, fictional money and real dealers, provided students with an on-campus alternative for their late Friday night. At around 12:45 a.m. the last cards were laid on the table and students made their way to the prize table to either purchase prizes or enter the raffle for larger prizes. In the midst of a crowd-generated drumroll, Cristina Dominguez was announced as the first winner, taking home the grand prize of a 32-inch Vizio television. Luck was certainly a lady that night, as Dominguez won the fourth pick of the raffle as well, netting her an Under Armour SF State sweatshirt.